Have you been to the beautiful Amalfi Coast? 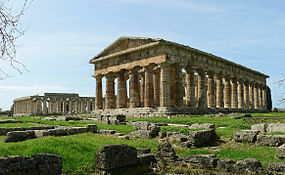 If you are planning a trip, there is a lesser known place just south of Salerno called Paestum. Paestum is an ancient Greek city located in the Campania region of Italy. It was founded 600 BC. It is also where the Allied Soldiers landed to defeat the Germans and drive them out of Italy. It is located on the sea with Salerno about 27 miles (1 hour) to the north and Agropoli 5 miles (19 minutes) to the south. There is a modern outlet mall nearby. These still stand and are magnificent to see. They are in better shape than most monuments in Greece. There are ruins (just foundations) everywhere. This is an easy site to get to. There are two roads between Agropoli and Salerno. One runs along the sea and has beautiful views of the sea. The other is a good road with gas stations, bars and restaurants. It runs between Agropoli and battipaglia. Then you get on the A3 Autostrada to Salerno or Naples. The sea is the Tyrrhenian Sea which is separated from the Mediterranean Sea by islands and Sicily. Salerno is a large city with an ancient old town. Agropoli, we spoke about yesterday, has great beaches, an old town and a large city. The A3 Autostrada links Naples (and the A1 Autostrada to the north) to the south and Sicily. This area ia very mountainous with mild climates all year-long. The mountain tops can have snow in the winter. Tomorrow we will speak about another ancient Greek site from the same period called Velia.